Lately I’ve been taking panoramas of places near home. 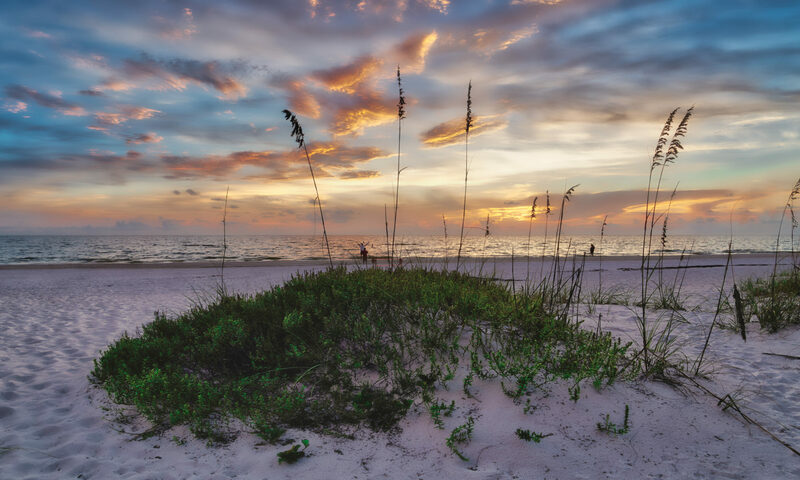 This is from the bridge to Anna Maria Island and is four images taken side-by-side and then stitched together. Actually I took six images but the full length is too long for social media. The images are taken in portrait mode meaning I held the camera on its side. The result is that there is a lot of detail, so much that you can zoom in to see a little things you wouldn’t normally see in a photo. The main reason for doing this is because the print resolution is so good. I love looking at panoramas displayed on walls. It invites you to get right up close and experience the image in a more personal way. But it is a physical medium, not necessarily a good fit for social media. All that aside, as you can see this was near sunset on a cloudy day and all kinds of strange things happened with the light and how it played out on the water. Funny thing is, had it not been a panorama I might not have even noticed all that detail. I took this while walking around in the rain on a Vancouver morning. That was back in January when the days were short and the rain was constant. Now in June the days are long with the sun rising at about five in the morning. I’m headed back there and looking forward to taking more photos in Van-city. The thing about Vancouver, or any major city for that matter, is that it’s so unlike the sleepy little town I live in. The change in scenery gives me all kinds of ideas for urban photography. I’m sure the same would be true for big city folk that visit central Florida, in awe of the beaches and sunsets. Change of scenery is a good thing. This was taken at the Telus Science World building. The leading line of the walkway and pillars are what I found interesting. The building itself is made up of unique architecture, it has a geodesic dome and odd structures along the outside. This is probably the second most photographed building in Vancouver next to Canada Place. In any case I can’t wait to get out on the streets in full urban photo mode. Here I am looking across the Manatee River on an early morning after the rains. The combination of the clouds and calm waters is just a lucky happenstance of timing. Any later and the breeze picks up to ripple the water. Any earlier and I was just standing in the rain. But as the clouds broke and the sun began to rise it created this dramatic affect in the sky. Quite frankly it reminds me of a painting of heaven. I’d like to think that in my own version of heaven this is what it looks like. Irrespective of that, I gravitate to idyllic scenes in my photography. Simple images that try not to cover too many subjects is best. Ironically, keeping it simple can easier said than done. I for one am easily enamored with all the little details, maybe because I’m a bit of a geek. But aesthetically, the more simple an image is the better, too many details water down the story an image conveys. Anyway, I can ramble on forever about composition, but in truth I consider myself a beginner, I have so much to learn and I expect it will continue to be a life long learning quest. But for now, simple, calm and idyllic; that’s my favorite recipe. This is the pier in Venice Florida on a cloudy afternoon. It’s the best pier around so when I come here I shoot it from as many angles. In most cases I have the pier pointing out to sea from the left or right of the frame. In this case I’ve take a more direct angle by having it bisect the water and clouds. This is an angle I like very much, especially when shot with a telephoto lens. As you can see I’m not exactly head on, rather I’m on the beach angling out, but the perspective of the telephoto lens has it appearing rather flat. Piers and bridges are a major source of inspiration for me. I have no idea why that is. Maybe it’s because they are objects that interact with bodies of water. If I lived in the mountains I’d be shooting waterfalls and lakes but in Florida it’s rivers, ponds and seasides. The final toning of this image was created with a Trey Ratcliff Lightroom preset called “She Finally Awoke”. I’m a big fan of Trey’s presets which I use for inspiration when starting an image. But in this case I used it when finishing and I didn’t change the preset one bit. That’s unusual for me but in this case it worked exactly the way I wanted it to. Anyway, that’s a little behind the scenes info on some of the aspects of how I created the image. There is a lot more but for now that’s the short version. There is nothing higher than a palm tree in central Florida. As a result there aren’t may places you can go to get a perspective of the landscape other than a bridge or lookout tower. Leffis Key however contains a dune covered with vegetation that provides just barely enough elevation to look out onto the inter-coastal waterway. In this image the sun is rising over the fishing village of Cortez. Whenever visitors ask me where to get fresh fish I always recommend Cortez. This is a single image HDR. That just means I didn’t use multiple exposures to balance the highlights with the darker areas. The sensor in the Sony A7R2 camera captures an very wide range of light so that images like this are possible. That wasn’t the case just a couple years ago unless we combined multiple images using HDR. There was a breeze blowing so that the grasses swayed from side to side. Using traditional HDR, I would have taken three shots and combined them, however that normally causes problems with ghosting of the grass as it moves between each frame. Those problems are eliminated with a single frame and so it makes possible compositions like this. The technology in cameras is getting better every year and it makes me wonder what we’ll be able to do in another year or two. It’s is an exciting time for photography and geeks like me. I took this picture on a recent walk around Perico Preserve in Bradenton. Its one of two outlets to the bay and facing an adjacent preserve. We are fortunate to have these preserves set aside. They are within urban areas yet they provide an important sanctuary for the regions wildlife. And of course they are natural setting for us humans to enjoy as well. By using a wide-angle lens the clouds appear to converge at the center. That’s an effect I like to use to emphasize the clouds. In Florida we don’t have mountains so clouds are good substitute for filling the upper half of the frame. I am standing on a footbridge above the inlet so the sides of the preserve provide natural symmetry. I think the symmetry is why I like this image, it doesn’t always occur in nature. I grew up in the western United States and was exposed to the wide open expanses of that region. So naturally I gravitate towards uncluttered landscapes such as this because it beautiful. Isn’t it funny how we ascribe beauty to nature? Without effort or design nature surpasses the most talented artist among us. I took this early one morning at the fishing pier in Sarasota. This is a long exposure that I’ve manipulated to enhance the water and the reflections. As you can see in my gallery I create images as much from may camera as my minds eye. I’m not so interested in documenting a scene, rather using the camera and my techniques as a canvas for my imagination. This is perfect example of that. The idea is that I try to bring my own expressions to an image. I do it mostly for myself because its creative and I get great enjoyment from it. As I create each new image I discover a part of myself in it. So each image is a part of me and as I share it we connect through a part of my imagination. In this way we might just be communicating at a deeper level than through other means. Sometimes it takes a lot of effort, other times no so much. Ideas for images come to me either as I take them or later as I think about them. Regardless, it’s free flowing, there are no rules or guidelines, just me playing with images all of the time. Even when I’m not engaged in creating images I’m still thinking about them. That’s what I call an upward spiral of art and creativity. I can think far worse things to be immersed in. As is normally the case, I had no idea where I was going. All I knew was that it was before dawn on a Saturday and I was driving somewhere to take a picture of something yet to be determined. It’s not a very exact plan but sometimes that’s just how I roll. Often I have no idea where I’m going when I go out to take pictures. Instead of turning left I turn right and just go with the flow of random-ness in the universe. I ended up outside the gates at Desoto Point looking at rain clouds and trying to remember why this was better than bed. I put on a poncho and walked to the shore. I told myself that once I got there I could turn around and head home knowing that I tried. Standing there in the rain I was grateful for the solitude, and the poncho. About the same time I noticed the clouds starting to break up. Sure enough the clouds parted, the sun rose and I captured the moment with what seemed to me like a bit of luck. I could have left for home before the scene unfolded, or not even walked the trail to the shore. The fact that I did and stayed seemed to me at the moment to be more chance than purpose. That attitude comes from many occasions where it doesn’t work out. So I suppose the odds were in my favor this time and I managed to get the shot, even if it was half by chance. The other day I was walking through the newly opened Perico Preserve when I spotted these Roseate Spoonbills. They were busy feeding in the shallows of a pond and they didn’t seem to mind me taking their picture. I was struck by the color of their feathers which reminded me of flamingos. When I was in southern France I heard that the flamingos are pink because they eat so much shrimp. I’m no expert but I wonder about that since even flamingos in captivity are pink. These spoonbills are not in captivity and I don’t think they eat much shrimp. I think the pink color is natural and it tends to confuse people like me into thinking they’ve seen a flamingo. I imagine it happens a lot here in Florida. Its pretty amazing that I could just walk upon these. I get a similar feeling when I see herons, egrets and pelicans right up close. Many of them have grown accustomed to people and will not flee as long as you don’t indicate harm. In fact yesterday, I was walking through another trail and came upon two rabbits. Rather than run they just parted to either side of the trail to let me pass and then resumed to what they were doing. Not sure where I’m going with all of this other than I consider it a privilege to interact with the wildlife. I guess I just don’t look scary enough. This is the Sunshine Skyway Bridge as it leads into Tampa Bay from the Gulf of Mexico. I was standing in my hometown of Palmetto about six miles away when I took this. I used a tripod to steady it since it was dusk and the light was fairly dim. The final image is composed of several parts combined into one. It’s an artistic rendering of the bridge as I imagine it. I do a lot of that with my photography, especially as I visit sites and scenes I’ve shot many times before. You might think I get bored from going to the same places time after time. On the contrary, it’s just the opposite; it fuels a desire to become more creative which in turn opens up all kinds of possibilities. At times I take pictures just for the raw material of a creative rendering such as this. When I sit down to create the image I use a lot of different tools in the same way a painter uses a brush and pigments. I can spend hours on an project, working away hour after hour lost in creative reverie. Then at some point, I run into a wall and put it aside. Then when I look at it later I may start up again. And so it goes until I’m done. On the one hand I’m never really done with an image like this yet on the other I have to draw a line somewhere. It can be hard to let go sometimes. I’ve walked away from this image several times only to come back and have another go at it. But for now this is it, I’ve drawn the line and I’m off to my next project.